While time marches inexorable onward, I’m still busy regaling you with the results of my March determination to get back into some sort of artwork – any sort of art work really – my abilities having somehow mysteriously atrophied due to non-use over the previous couple of years. There followed other comments about the shoes from other members of the group then we segued off to shoes in general and ended up with the death of Scott Walker and rodent stories quickly followed by cat stories and many, many photos of cats. Thanks for coming by today, I love that you did. I’ve been meaning to join in with the monthly ‘ScrapHappy’ blog share for years – so many opportunities have come and gone and I never quite had my act together. But at last the time has come! So here I am, joining in with Kate over in Chiconia and all the other scrappy people all over the globe because I’ve been making bookmarks with my painting scrap paper. Sometimes I make cards or notebook covers with the output too, this time it has just been bookmarks. When I paint I generally have bits of scrap paper lying about on which I wipe my brushes. It might be plain copy paper, it might be kitchen towel paper, it might be baby wipes used to wipe away paint on the canvas and expose a bit of the under layer, sometimes it’s a bit of proper heavy duty mixed media paper that went wrong. No matter what it is there comes a time when the wiping is finished and the paper is full and of no further use. Once I used to bin them and grab a fresh sheet and start over. Then one day, when a full sheet was dry and I was about to chuck it out I looked again and thought that has potential and it didn’t go in the bin. Ever since then I have saved those sheets and when I’ve got nothing better to do with my time I gather them up and begin to play. Sometimes I lay down a bit more paint through a stencil, sometimes I grab a stamp and make marks that way. Sometimes I pick up sharpies or gel pens or crayons and start to doodle. Doodling is my favourite occupation. Next comes a backing – here’s the box of paper and card off-cuts that are utilised for this part of the operation. They themselves are leftovers from card making and die cutting and sometimes are leftovers from other gelli print making sessions. I lay down a few different backing colours to see what I like. The process is generally careful for the first two or three, then it’s anything goes and lets see what happens. The photos below are the same painted piece on different colour backings. Do you have a particular colour combo you would have gone with? And finally after a couple of days here is a sampling of some book marks – this is a mere fraction of the amount I made in this session. I have bookmarks for Africa!! The finished painted pieces are texture rich and interesting. I make them smaller than I used to because I have learnt from my friend Derrick that it is fun to leave the bookmark in a book when you have finished reading it. Especially if you note the date on the bookmark. They aren’t for keeping, like books these are made for sharing round. We interrupt normal transmission to bring an important update…. He’s always such a good boy, though if you ask him he’s never quite sure …. And he is, of course, my boy, the best puppy ever! I started this sketch a week ago – if you popped by to read the previous post you may recall seeing the beginning of it. It’s a double page spread in my practise journal and I worked on it most evenings, often erasing lines as often as I sketched them. I didn’t use any reference photos and it shows – and I changed my mind about which quote to use at the last minute…… And of course I’d do it very differently if I decided to make a painting…. ……… but it was a good exercise and a chance to work through some of the emotions I was feeling. I’m hoping that next post I can return to plump teddy bears and other things that got themselves doodled, drawn, coloured or painted this month. Thanks for coming by today, I’m always happy that you did! I read Carl Jung’s autobiography ‘Memories, Dreams, Reflections’ at a critical time in my life. One aspect in particular had struck me and contributed to the unfolding process that lead to my re-experiencing, understanding and, ultimately, healing the events of my childhood. 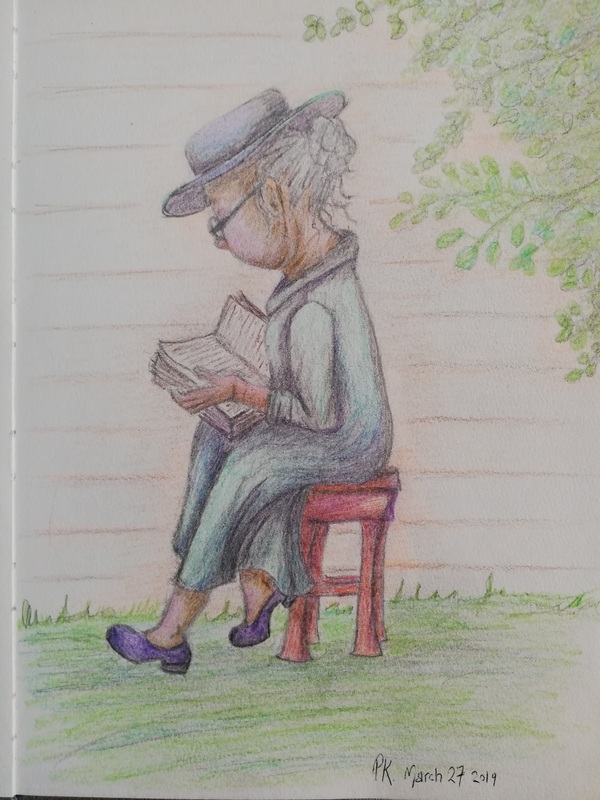 It was without real surprise therefore, as I sat doodling and colouring in my practise journal one evening last week, a memory floated through my mind and I caught it. I recalled the pivotal scene in Jung’s book when, searching for a deeper understanding of the recesses of the mind, he decided to let go of his sanity and immediately experienced himself as dropping through the floor of his study into the abyss. Once, long ago, I emulated Jung in that moment of consciously choosing to let go, to drop the drop. In a time of deep despair, when it had been made abundantly clear to me the ultimate in paternal wickedness had taken place and the ultimate in maternal indifference had always existed, I would stop trying to deal with the chaotic aftermath, the soul pain, the anguish. I would simply let go just as Jung had. I would confront my demons, do or die! In a flash I was falling into profound blackness. Terrified at the speed of the fall I grasped at the sides of the pit, trying to hold onto the last threads of my sanity with my fingernails. But the fall continued, I kept slipping and sliding and tearing my hands as I tumbled down that pit of despair. Again a vision of Jung in his study appeared in my mind and I remembered, I knew, I must let go. I was terrified. I fell no further, gently my feet touched ground. I was already at the bottom of the pit, perhaps I always had been. And as I stood in that deep, still, silent, blackness from far, far away a light began to glow. What followed changed my life. Perhaps I should say changed me at a fundamental, primeval level. Changed the way my brain and mind and heart worked. Changed my very being and changed my life and my view of the events of my life. In almost thirty years that experience has never faded from my memory and my understanding of why we live, why we have this human experience has only deepened with the passing of the years. I looked again at the page on which I was doodling and colouring and wrote ‘Memories, Dreams & Reflections’, closed the book and went to bed.